Casey Corr: Hey, person in Hong Kong -- why are you reading my blog? 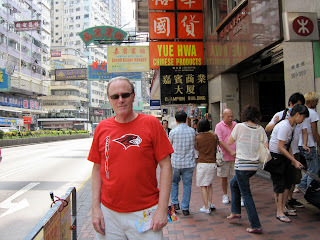 Hey, person in Hong Kong -- why are you reading my blog? Google analytics has been updated to show in real time the geographic origins or your readers. Right now, somebody in Hong Kong is reading my blog. Please! I'm dying of curiosity! My one Hong Kong reader, please go to the comments and just say who you are. If you are a cyber warrior, sniffing for a backdoor into NSA's mainframes, use the code, "I love Jack Bauer." I will write back, "Cloey, I don't have time to explain. You'll just have to trust me." We will meet at the Kowloon station on March 1, 2012. I will be wearing a Redhawk warm up jacket, holding a copy of Lonely Planet. Disguised as a conspicuous middle-aged white man, in Seattle University t-shirt, America's undercover agent prepares to steal recipes for Dim Sum.